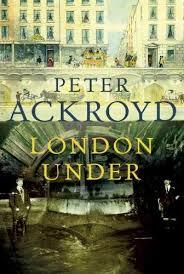 If I bemoaned the lack of poetry in Nick Cooper’s London Underground at War , then I found it- as I might have expected- in the astoundingly prolific Peter Ackroyd’s London Under. His underground world is often a watery one, based on the rivers that flow beneath the streets of the metropolis. He starts by considering the wells that early Londoners were so dependent upon, and which are often marked by street-names in the world ‘on top’. In ‘Forgotten Streams’, he traces the thirteen rivers and brooks of London as they entwine themselves with the underground infrastructure which has been superimposed on them in the form of sewers and tube lines. The pages are sprinkled with black-and-white illustrations, many from the early nineteenth century, which show the presence of these rivers before they were subsumed by development. The chapter ‘Old Man River’ concentrates on the Fleet, the most powerful of all London’s buried rivers. ‘Heart of Darkness’ examines the construction of the sewers that carried away the filth from London while the ‘Pipes of London’ looks at gas and water piping that brought facilities to London. The ‘Mole Men’ deals with the Thames Tunnel, which from an engineering viewpoint was the precursor of the Underground, which is dealt with in ‘The Deep Lines’. Three chapters, ‘Far Under Ground’, ‘Buried Secrets’ and ‘The War Below’ deal with much of the material covered by Cooper’s London Underground at War, although in a more people-focussed manner. The final chapter ‘Deep Fantasies’ draws out the theme of imagination and the underground which he has mentioned in several places in the book. There are no footnotes in the book, although it does include a bibliography at the end. Like so much of Ackroyd’s work, it is atmospheric and erudite, steeped in literature and popular culture, especially that of the nineteenth century. The language flows seductively and smoothly in a very easy, beguiling read. And by coincidence, what should be on SBS recently but ‘Secrets of Underground London.’ It’s on SBS Catchup until 25 November 2014. This entry was posted in Book reviews and tagged Peter Ackroyd. Bookmark the permalink. Goodness, I remember reading that original London, it was a real chunkster!